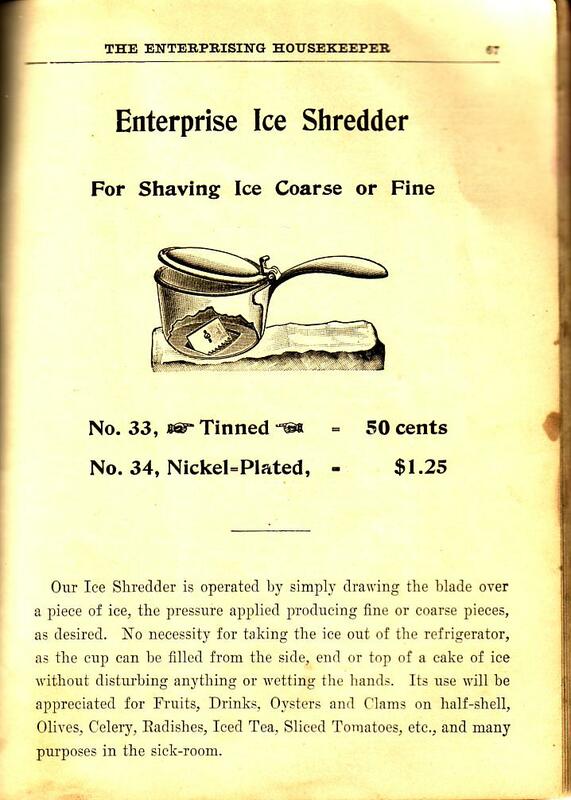 So, my earliest cooking pamphlet (that has a confirmed date) is now this 1906 item, the sixth edition of “The Enterprising Housekeeper,” by Helen Louise Johnson, provided compliments of Hamilton Hardware Corporation of Waterbury, Connecticut. It was actually published by The Enterprise Manufacturing Co. of Pennsylvania, a manufacturer of kitchen implements – hand-cranked grinding and pulverizing mills (mainly for coffee, it seems); meat and food choppers (and a sausage stuffing attachment); a raisin and grape seeder; a fruit, wine and jelly press (we’d call this a juicer now, I think); cherry stoners; an ice shredder (shown here); spice mills; a meat juice extractor; “sad irons” (they look like ordinary clothing irons to me); polishing irons; bone, shell and corn mills; and a multi-purpose sausage stuffer, lard and fruit press. And you thought modern cooks were gadget-mad, didn’t you. Melt the butter, add the bread crumbs, and when well mixed, the meat, seasoned. Add the beaten yolks of the eggs and stir in a saucepan over the fire until the mixture is heated through. Cool, form into small round balls, cover with egg and bread crumbs and fry in smoking-hot fat. Not sure I agree with any but the last of those sentiments, but it’s a funny bit of rhyme. 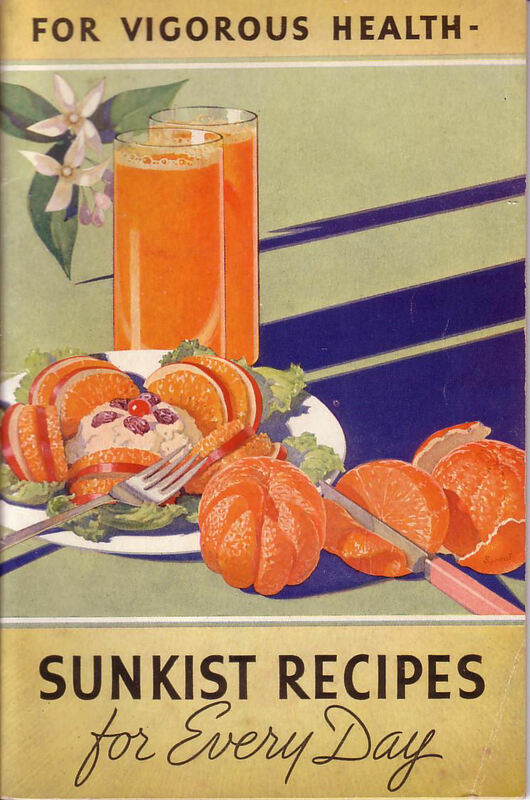 I’m pairing this one with 1936’s “For Vigorous Health – Sunkist Recipes for Every Day,” published by the California Fruit Growers Exchange of Los Angeles, California. It includes recipes of every kind – a page devoted to Baked Oranges; breads; appetizers; salads and salad dressings; main courses; drinks; and desserts. Then there’s the menu guide (different meals, child’s diet, reducing diet, invalid diet), suggestions and hints for entertaining, place settings for breakfast, luncheon, and dinner; and household uses for lemons. All this in only 48 pages (including index)! 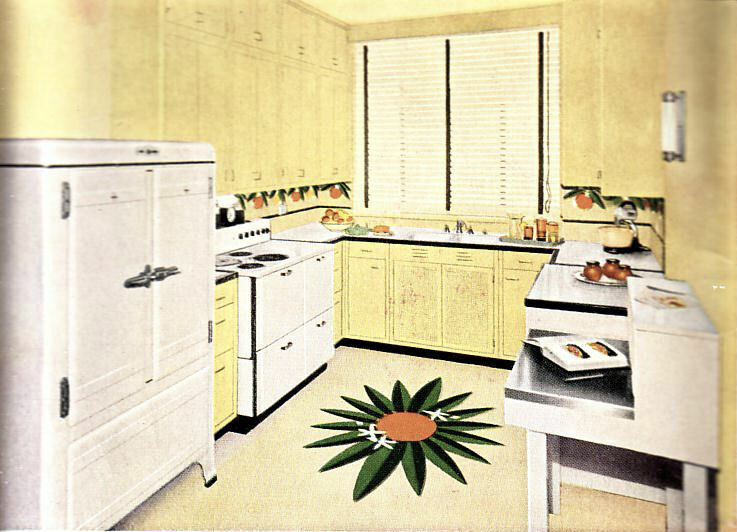 There’s also a picture of “The New Sunkist Kitchen,” which I’ve scanned as an example of a top-of-the-line kitchen for 1936 – complete with ice chest and what looks like an electric stove. And decorated with oranges, of course. Bake Orange Sponge Cake in muffin tins. Remove centers and fill with 1 cup Sunkist orange pieces and 1/2 cup crushed pineapple. Top with whipped cream, orange slices and candied cherries. Bake in loaf or tube pan in moderate oven (325 F.) 35 to 40 minutes. Ice with Sunkist Butter Icing (recipe, page 39).